Bai Bureh was the great ruler and military strategist who led the Temne uprising against the British in 1898. His father was an important Loko war-chief, and his mother probably a Temne woman from the region around modern Makeni. He was sent as a young man to Gbendembu, a training school for warriors where he earned the nickname "Kebalai", meaning "one whose basket is never full" or "one who never tires of war". Kebalai became a famous war leader in the 1860s and 1870s, serving under a Soso ruler in a long Jihad to establish correct Islamic practices. In 1886, Kebalai was crowned ruler of Kasseh, a small kingdom near Port Loko, and given the royal title of Bai Bureh. The new ruler soon gained a reputation for stubborn independence that annoyed the British administration in Freetown. On one occasion, Bai Bureh refused to recognise a peace treaty the British had negotiated with the Limba without his participation, and on another occasion, he led warriors on a raid across the border into French Guinea. When the British declared their Protectorate in 1896, they quickly issued a warrant for Bai Bureh's arrest, fearing that he would foment resistance to the new "hut tax". But the British could not capture him, and so began a long war of aggression to which Bai Bureh valiantly responded by organising a large-scale guerilla revolt that lasted for ten months. He brought warriors from several Temne states under his command, as well as some Loko, Soso, and Limba fighters â€” and he held the initiative over the vastly more powerful British for the first four months. Bai Bureh's forces surprised the British troops time and again, subjecting them to punishing fire from behind concealed war fences, before slipping away unseen into the bush. 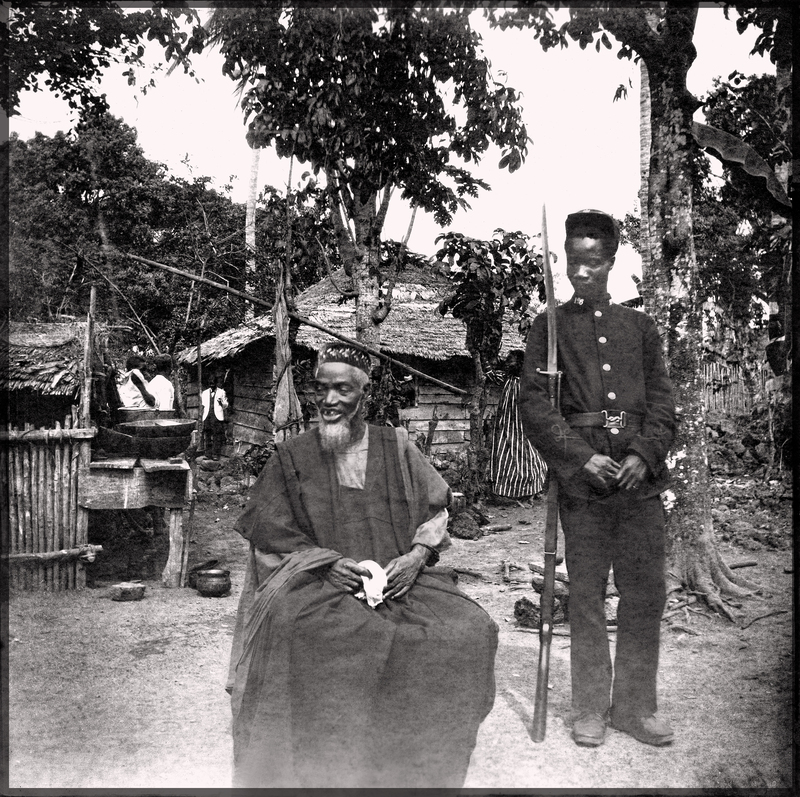 Bai Bureh acquired a reputation for supernatural power, and was believed to be bullet-proof and to have the ability to become invisible or stay for long periods under water. The British offered a reward of Â£100 for information leading to Bai Bureh's capture, but no one would come forward â€” a colonial official wrote that Bai Bureh's men "loved their chief, and remained loyal to him to the very last". Bai Bureh was finally captured on November 11, 1898 and taken under guard to Freetown, where crowds gathered around his quarters day and night to gain a glimpse of the great man. The British sent Bai Bureh in exile to the Gold Coast (Ghana), but brought him back in 1905, reinstating him as a Chief of Kasseh. Sierra Leone's greatest hero died in 1908. Almamy Suluku was a powerful Limba ruler who maintained his independence as long as possible through brilliant political manoeuvring. He was the son of Sankailay, chief of the Biriwa country, with its capital of Bumban, near modern Kamabai. As a young man, Suluku became the Kurugba, or war captain; and under his military leadership, Biriwa became one of the largest kingdoms in Sierra Leone. Suluku was crowned Gbaku (King) over a kingdom that now covered almost ten percent of the Sierra Leone hinterland. But Suluku was not satisfied with territory alone, and he set out to make his country wealthy as well. He fostered the trade in gold, ivory, hides, and foodstuffs that passed through Bumban on the way southwest to Freetown; and he gave effective police protection to the traders in his realm. His progressive rule impressed the British administration in Freetown, which sent him annual gifts throughout the 1880s. When Samori Toure's Mandinka forces occupied Biriwa in 1884, Suluku pretended to co-operate while sending urgent messages to the British warning of a disruption in trade if the Mandinka did not withdraw. The British accepted Suluku's arguments, persuading the Mandinka to leave Biriwa country. Thus, while other Sierra Leonean kings suffered costly defeats in futile military resistance, Suluku managed to have his way through political strategy alone. In the 1890s, as British power increased, Suluku pursued his own independent policy while making the British believe he was their loyal ally. He sent frequent messages of friendship to the British Governor and entertained royally every British delegation that arrived in Bumban, but did exactly as he pleased. Some lower ranking officers warned of Suluku's deception, but Freetown was convinced of his loyalty. When the 1898 Rebellion broke out, Suluku sent warriors and weapons to Bai Bureh; but when the British complained, he sent them a letter expressing his support for their position and offering his services as mediator! After the Protectorate was established, the British wanted to break up Suluku's kingdom into small chiefdoms, but Suluku's subjects refused to cooperate as long as the old Gbaku was still alive. When he was very aged, a British official asked Suluku to name his successor under the new and tightly controlled colonial structure. The old Gbaku's reply: "Suluku will never die". Nyagua was a wise and respected Mende ruler who, despite his gestures of friendship to the British, was destroyed in the advance of colonialism. Nyagua ruled a great realm, covering much of the territory between modern Kenema and Sefadu in the Eastern Province. By all accounts, he was a good king who ruled with strength and justice. He conquered many outlying districts to enlarge his domain, but some came voluntarily under his control, in view of his reputation as a protective and benign ruler. Nyagua built up an impressive capital at Panguma, and is said to have possessed a vast number of slaves and about four hundred wives. As British power increased in the Sierra Leone hinterland, Nyagua realised that he did not have the strength to resist it. He therefore co-operated with the British on several occasions by signing a treaty of friendship, capturing warriors who had raided a customs post, and sending a son to be educated in Freetown. But Nyagua saw himself as a friend, and not a vassal or servant of the British. He was the king of a small allied state, and felt that he deserved the respect of a sovereign ruler. When a travelling British Commissioner called Nyagua to a meeting abruptly at his own convenience, the Mende King refused to attend; and when the British Governor sent an "order", Nyagua replied that he must take up the matter with his elders first as custom required. British officials began to see Nyagua as "arrogant" and troublesome, despite his obvious co-operation; and when the 1898 Rebellion erupted, they ordered his immediate arrest. Nyagua had commanded his people to remain at peace for their own protection, and his followers attacked the British only after the arrest of their king. Nyagua was taken to Freetown on "suspicion of disloyalty" and sent with Bai Bureh into an exile from which he never returned. Even the British officials acknowledged that Nyagua had committed no hostile act, but they felt his influence was too strong for him to remain a chief in their new Protectorate. Nyagua's only crime was to command the respect and affection of his people and to insist upon the dignity of his office. He was among the last of Sierra Leone's proud and independent warrior-kings. Bai Sherbro Kpana Lewis was the last great ruler of all the Sherbro. He exercised strong influence, if not authority, over all Sherbro rulers by the end of the last century. Part of his fame rested in his pervasive use of the Poro, a secret society, to oppose the incoming colonialists. He was considered so powerful that, while Bai Bureh was allowed to return from exile after the 1898 Rebellion, Kpana Lewis continued to be held in exile in the Gold Coast, where he died in 1912. Kpana Lewis was the last Sherbro ruler who came close to realising the power of the Kong Kuba, the title of the King of all the Sherbro. His grandfather, the last Kong Kuba had signed a treaty ceding Sherbro country to the British in 1825. But the British did not exercise any direct authority over the Sherbro until the end of the century. Though many of the provinces of the Sherbro Kingdom had become autonomous by the time Kpana Lewis assumed office in 1879, he was able to bring quite a few of them back under the authority of the Bai Sherbro. This he did by using the enormous power of the Poro, of which he was a leading member. Poro is reported to have spread into the interior of Sierra Leone from Yoni on Sherbro Island, which was the capital of the Sherbro Kingdom and where Kpana Lewis resided. He thus came to restore something of the old glory of the Kong Kuba, and to regain authority over former mainland provinces of the once powerful Sherbro Kingdom. When the British proclaimed a Protectorate in 1896, many of the terms of the Protectorate Ordinance were distasteful to the local rulers. Above all was the house tax. Kpana Lewis was one of the few leaders who actually led a deputation of chiefs to Freetown to protest against the tax. While the Governor informed him that Sherbro was in the Colony and was therefore unaffected by the tax, he informed the other chiefs they would have to comply with the new regulations. Kpana Lewis did not sit back and leave the other rulers to continue protesting alone because his own territory was not involved, although some chiefs did just that. Kpana Lewis, on his return to Yoni, used the Poro to give force to his disgust with the colonial measures. The Poro traditionally had a role of ensuring concerted action for political or economic purposes. It could as easily place a ban on war as on the harvest, a ban which no one dared disobey. It thus fulfilled the role of a modern judiciary system and police force. It was this that Kpana Lewis now used to effect a boycott of trade with Europeans and Krio traders, the latter being seen as accomplices of the colonialists. When Alldridge, the District Commissioner, called a meeting of chiefs in the area to warn them against this kind of action, one of them, the Sokong of Imperri defiantly said that he had to confer with Kpana Lewis, whom he regarded as his overlord, before deliberating with the District Commissioner. So great then was the Bai Sherbro's power and influence over these rulers that they were willing to openly defy powerful British officials in favour of Kpana Lewis' authority. The British then quickly passed a law making it a criminal offence to use the Poro to restrain trade. When the 1898 Rebellion broke out in the South on April 27, 1898, nothing could convince the District Commissioner that Kpana Lewis was not the brain behind the resistance. With no evidence connecting Kpana Lewis with the Rebellion, he was detained as a suspect and subsequently exiled to the Gold Coast with Bai Bureh and Nyagua. The British then installed their own nominee, Fama Yani, as Bai Sherbro. Fearing that if Kpana Lewis returned, his presence would lead to the overthrow of Fama Yani, the British refused to allow his return, thought Bai Bureh was ultimately brought back home. In spite of protests by Kpana Lewis' son, called Kong Kuba, and of intervention by the Anti-Slavery Society in London, the British Government held him in the Gold Coast where he died after more than a decade in exile. Madam Yoko (Mammy Yoko) was a brilliant and ambitious woman who used her friendship with the British to gain control of Kpaa Mende, but in the end that very friendship may have destroyed her. As a child, she was called Soma but acquired the name Yoko at her Sande initiation where she attracted admiration for her beauty and graceful dancing. After an unsuccessful first marriage, Yoko became the wife of Gbenjei, Chief of Taiama; and although she was barren, Gbenjei made Yoko his head wife. When Gbenjei died, Yoko married Gbanya Lango, a powerful war-chief at Senehun. In 1875, she saved her husband from a long imprisonment under the British by making a personal appeal to the Governor, who was charmed by her beauty and feminine graces. Afterwards, Gbanya used Yoko in diplomatic missions to the British and to other chiefs. In 1884, after the deaths of Gbanya and his successor, Yoko became the "Queen of Senehun". Within a few years, she had brought all of the Kpaa Mende region (now fourteen chiefdoms) under her nominal control through alliances, warfare, and her ability to call on the support of friendly British troops. She established a famous Sande bush in Senehun where she trained girls from throughout Kpaa Mende, sometimes giving the most beautiful in marriage to sergeants of the Frontier Police or to important chiefs. When the British declared their Protectorate in 1898, Madam Yoko commanded her people to pay the new tax —but her sub-chiefs rebelled. They held a secret meeting, blaming Yoko for "spoiling the country" by supporting the British police, taxes, and forced labour. Yoko took refuge in the police barracks which withstood several attacks by her own subjects, and she was later awarded a silver medal for her loyalty by Queen Victoria. Madam Yoko ruled as a Paramount Chief in the new British Protectorate until 1906, when it appears that she committed suicide at the age of fifty-five. If true, her reasons have never been altogether clear. A British official wrote that she had obtained all there was to be had in life—love, fame, wealth, and power â€” and felt there was nothing more to look forward to. But her attempts to manipulate the British for her own ends had turned around on her. She had lost the support of her people, and perhaps she was bored and saw nothing challenging in Britain's new and tightly controlled protectorate.